Thank you for your email. We would love to help you tame the clutter of your home. By calling in the experts, you are taking control of that constant cycle of "stuff maintenance" so that you can feel inspired by your home, once again. Congrats on taking the first step! It sounds like your project should start with ___ sessions to tackle the categories/areas you describe. Note we declutter category by category (versus room by room). We always recommend starting with clothing. Visit our Client Welcome page to secure your session date! Start time varies between 8:30am - 9:30am -- indicate preference on form. We're excited at the opportunity to assist you in the transformation of your home! The NM In-Home Consultations, with a focus on decluttering, utilize the simple updates that can make a huge impact on a space. Think: a change of a paint color, the replacement of a key piece of furniture, or an upgrade in lighting. These consults prioritize your to-do list and jumpstart your motivation to revamp your space! Before: Access to the NM Classroom with selected readings and self-assessment tool (note this takes approximately 45 min to complete) We ask these questions to gain context about your space and your habits within the space. We suggest cozying up with a mug of tea and digging into this content for a quiet hour. After: You receive a customized PDF with Design Recommendations, furniture recommendations, paint color ideas, and prioritized to-do list to complete your space. At this point, if you would like to cover additional rounds of design recommendations, we enter into the hourly design rate of $125/hr. "We have lived in our apartment for 8 years. In that time, we have added another family member, outgrown certain spaces and pieces, and have needed to find ways to be more efficient with our space. What to do with a couple of spaces in particular continued to confound us and we found ourselves feeling limited and uninspired as a result. That is, until we met Kyle. In one short hour, she listened closely to our needs, habits, and frustrations, she empathized and asked insightful follow up questions, and ultimately created a punch list of fantastic ideas and suggestions that took into consideration our family, space, lifestyle, budget, and time frame. She even helped us prioritize each item on the list. She is way too cute, hip, and youthful to call a fairy godmother (I wanted her help with every room in the house, as well as my wardrobe, after that consult! ), but that's how it felt. She waved her wand and helped reignite our creativity, motivation and appreciation for our sweet home." -Abby S.
Complete Client On-Boarding (Note: takes approximately 1-hr to complete). Upload a video of your space to YouTube or Google Photos. It's most effective to focus on one primary area that isn't working for you. Complete selected readings (Some are required, others recommended. All the articles are quick and worthy reads! Please let me know if you have any questions! Or, if you need to select from more available dates. Thank you for your email! We would love to hold a phone consultation with you. Each phone consultation is 45 minutes ($225). You provide information about your space during the on-boarding process, so that we come to the call prepared with context about your space. During our 45-minute phone call we jump right into answering all your burning questions. 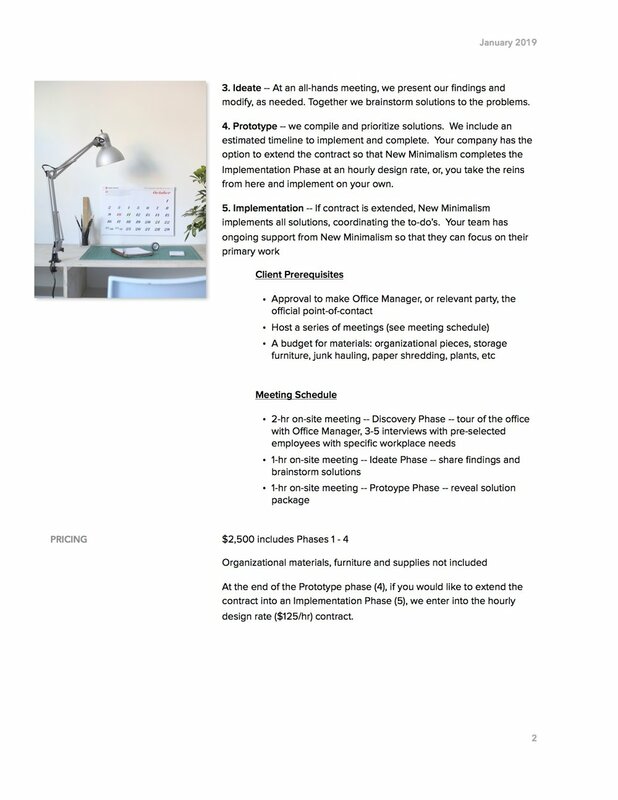 After the consultation, you receive your customized PDF prioritizing your Action Plan. Complete selected readings -- Some are required, others recommended. All the articles are quick and worthy reads! Note: the entire on-boarding will take approximately 1-hr to complete. 2018 P&L Statement - Note Guaranteed Payments (Acct 6000) are the payments I pay myself for the in-person client work.